In a very short amount of time, Oregon Ducks head football coach Chip Kelly has emerged as one of the most successful coaches in all of college football. Since taking over for longtime coach Mike Bellotti, Kelly has put together a 34-6 record, while appearing in three consecutive BCS Bowl games. Last season, Kelly and his Oregon program lost a heartbreaking battle to Auburn in the BCS National Championship Game. Undeterred by the 22-19 defeat, the school bounced back with a vengeance. Their two-loss season culminated with a 45-38 victory over Wisconsin in the 2012 Rose Bowl. The 2010 AP Coach of the Year's future appears to be incredibly bright. Kelly has proven to be both an excellent recruiter and outstanding sideline general. When combining these accolades with the program's remarkable support from Portland based Nike, the sky is truly the limit for the team from Eugene. Tuesday, while still experiencing the afterglow of his triumph in Pasadena, Kelly was spotted at the food court of the Westfield Century City Mall, located across the street from the Hyatt Regency Century Plaza, Oregon's base during their stay in Los Angeles. 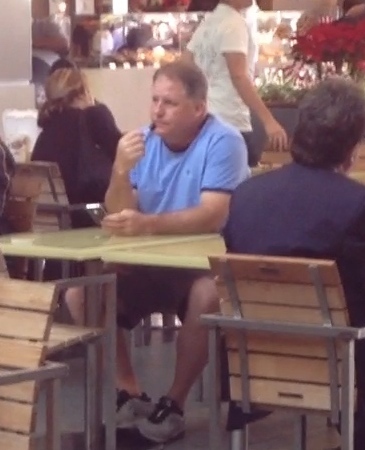 Per this ifollosports.com original photo, the big-time coach is seen holding a table for his group of lunch mates. Adorned in shorts, a short sleeved shirt and what look to be Nike shoes (no surprise there), the 48-year-old coach appeared to be basking in both victory and the plentiful LA sunshine, as he played around on his handheld device. Life is very good for Chip Kelly these days!